It's been a couple of weeks since my last post but, needless to say, the fight against the effects of pollution on our neighborhood and its inhabitants has not taken a break. "about 40 neighbors (actually over 70 signed a Red Hook Civic Association petition at the event) donned face masks to protest the planned opening of a concrete plant next to the Beard Street Ikea — across from a community farm and near popular playing fields." 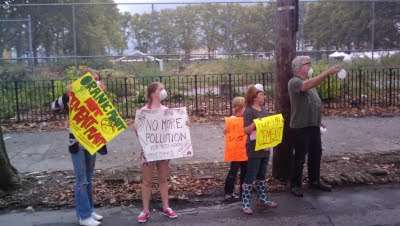 "The neighbors, who carried signs reading “No More Pollution” and “Honk 4 No Cement,” said they oppose the plant because its fine dust would coat the organic pumpkins and eggplants at the Red Hook Community Farm." It was great to see the residents of Red Hook and members of community organizations including representatives from the Red Hook Houses come out in solidarity against the seemingly inappropriately placed plant. The fact that the establishment of the cement plant seems a fait accompli didn't seem to deter nor dampen the enthusiasm of the protesters. One of the positive things to come from this event, apart from the sense of neighborhood unity, was the statements that came from Jim Vogel, aide to State Senator Velmanette Montgomery. He spoke out in a way that other representatives, including Councilmember Sara Gonzalez haven't on this matter. "his office would keep fighting the plant because the neighborhood has changed since the “heavy industry” zoning was put in place decades ago." This was a welcome statement from Mr. Vogel that reflected the fact that, despite often being described as "industrial", Red Hook is a mixed use neighborhood that has dense residential populations. How can you describe Red Hook, as the Brooklyn Eagle did in a recent article (here), as a "Brooklyn industrial neighborhood" when you have over 11,000 residents with around 8,000 people living in the Red Hook Houses alone? It's easy for these noxious activities (and I put the cement plant in that category) to be thrust into our neighborhood and its pollution onto our food and into our children's lungs when the neighborhood is portrayed as being without meaningful population. Our people shouldn't be ignored, and it shouldn't take a lawsuit to have their value and dignity recognized. It reminded me of statements the Obama administration's ex-"Green Jobs Czar", Van Jones, made about creating green jobs. He asserted that a fair and just "green economy" shouldn't as a consequence have "throw-away people", the people who end up being the "collateral damage" who carry the burden of the economic prosperity of others. It's a matter of environmental justice, and it's an ongoing challenge in our neighborhood in dealing with the development that often happens - development that more times than not seems to proceed with ignorance of or disregard for the resultant negative effects of pollution, congestion and other impacts on our residents. The same has been the case with the expansion of the operations of the Container Terminal that is being created by the relocation of Phoenix Beverages to the Brooklyn Piers. There has been no word on the pollution mitigation measures that were supposedly being pursued at the Port, asserted in statements made by Mr. Yates, ASI's director of commercial operations for the container terminal, saying that the implementation of shore power is being pursued "diligently". (see my post here). As I said in that previous post, I'm not holding my breath on that one. Also, there has been no further word on the implementation of "shore power" at the Brooklyn Cruise Terminal, despite the EPA's recent $3 million grant to fund the infrastructure required. (my post here). I have reached out to the New York City Economic Development Corporation on what the state of affairs is on this matter, but have not yet received a response. It's particularly frustrating to hear nothing on this matter when the residents of Red Hook, including the 40% of our population suffering from asthma, are continuing to breathe in the equivalent of 12,000 cars' emissions per ship, per day, every time a ship is in - as is the case today and has been regularly the case over the summer. It is also frustrating to see that other ports around the world are getting this stuff done (see story, about Vancouver's newly established shore power practices, "Princess Ships Start Plugging into Shore Power at Port of Vancouver" - here), while here in the city that never sleeps we seem to be asleep at the wheel. And also this concluding statement under the heading "Port Community Relations"
"Ports can also be bad neighbors by ignoring residents of the communities living next door, or making little or no effort to solicit community input into port operational decisions that will directly affect the life of the community and its residents. Many U.S. ports have developed decidedly hostile relations with their neighbors, not just because of the pollution the ports produce, but because they have consistently ignored residents of nearby communities, refusing sometimes even to share critical information about possible effects of port operations." This statement got me thinking again about the lack of Environmental Impact Study that was required regarding the EDC's plan to expand the operations of the Container Terminal. What are the "possible effects" of these expanded port operations - and why are we being asked to take all of this in "good faith". As with the cement plant, the effects on the already vulnerable residents seem to be ignored. Will it take a lawsuit to get the impact assessed? Where is the EPA on this? Well, I decided to write a letter to the EPA - here it is. My name is Adam Armstrong. 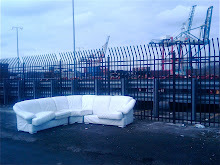 My family and I live in Red Hook, Brooklyn, the dense residential and mixed-use waterfront neighborhood abutting the Brooklyn Cruise and Container Terminals. Recently, the New York City Economic Development Corporation in conjunction with the Port Authority of New York and New Jersey has signed a 20-year lease with Phoenix Beverages, an importer of beer and other goods, for a site in Red Hook on the Brooklyn waterfront that includes Pier 7 and Pier 11 on the Atlantic Basin. These goods will be arriving by ship, we are being told, and those ships will be docking and unloading at Pier 10, part of the Brooklyn Container Terminal operated by American Stevedoring. The distribution of the goods from that site will require roughly 200 truck trips a day, with the operators hoping to grow their business in the future. There has been great unease and concern in our neighborhood about the environmental impact of this new use of the waterfront including the impact of the trucks themselves - both with pollution and congestion - and the increase of ship traffic that will inevitably occur with this new business. Phoenix Beverages has said that they will convert their fleet of trucks to CNG, however they have been given a 7-year time frame to comply. The EDC said that Phoenix will be in breach of their lease requirements if they do not comply, but there are no benchmarks to meet within that time frame. This is something that doesn't bode well for the quick conversion to the cleaner - yet, still polluting (CO2, Carbon Monoxide etc.) - fuel. Regarding the matter of the ships - Red Hook and our surrounding neighborhoods are already suffering from the impact of the emissions from ships with both the Brooklyn Container Terminal and the Cruise Terminal at our doorstep. We are becoming more aware of the carcinogenic effects of ship emissions, and I, after finding out about these facts when the Cruise Terminal was being planned 5 years ago, was recently driven to start a blog to help raise awareness of these troubling facts and to advocate for the implementation of clean ship practices and technology, such as "shore power" or "cold ironing", in Red Hook, as well as other port pollution mitigation practices such as a "clean truck program". We are very grateful for the EPA's statements about the dangers of ship emissions - statements that were used as support for arguments advocating "cold ironing" when the matter of the setting of electricity tariffs was being sought at the Public Service Commission regarding the proposed use of shore power at the Brooklyn Cruise terminal - I include these important facts in the side-bar of my blog. (I'll paste them on the bottom of this email). Recently, the EPA has given a grant to the Port Authority that will enable the Cruise Terminal to build shore power infrastructure - something that the Port Authority and the Cruise operators have committed to, but with no time frame yet given for implementation. However, and this is important - there is no such plan for the Container Terminal. Now we see that the relocation of Phoenix Beverages to the Red Hook piers will mean an expansion of the operations of the Container Terminal, but with no real commitment to lessen the added impact of the extra ships and trucks and the dangerous emissions they create. We have been told, to our disbelief, that neither the EDC nor Port Authority is required to do an Environmental Impact Study to assess the impact of this expansion. It is apparently not required by law in this case. However, some of us have strongly argued that there is a moral obligation to do a study, especially when this expansion of operations and accompanying increase of pollution is thrust on a dense neighborhood that: 1) already has high asthma rates (40% of children); 2) has a high incidence and risk of cancer (as shown by recently released EPA statistics): 3) is sandwiched between the already unmitigated polluting activities of the port and the heavy traffic of the BQE; 4) is already overburdened with pollution from truck, bus and car traffic and congestion (with no traffic evaluation being done since the introduction of IKEA and Fairway); 5) is disproportionately comprised of the people most vulnerable to these pollutants - and I quote the EPA - "children, the elderly, people with lung disease, those who exercise outside, and low-income and minority communities." - That is Red Hook. I urge you to look into this situation and to advocate for an Environmental Impact Study and pollution mitigation at the Container Terminal. The EDC's stated goal is to "grow" the Container Terminal, and without the implementation of clean practices it will be the people of our community who will be carrying the burden of the EDC and Port Authority's attention to their "bottom line". • a. Shore power is a crucial step for cleaning our air and improving health of New Yorkers. • b. Ocean going vessels that dock in New York City typically burn high sulfur fuel in diesel engines to generate auxiliary power. • This combustion results in exhaust containing NOx, SOx and particulates and such exhaust is a likely carcinogen. 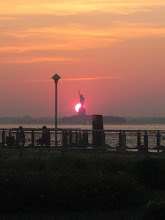 • c. New York City air quality is among the worst in the nation and port related emissions are meaningful and avoidable." • d. Such air emissions are harmful to the pubic generally, and especially to our children, the elderly, people with lung disease, those who exercise outside, and low-income and minority communities located near ports. • e. Implementation of a shore power tariff is consistent with economic development in New York City. • f. Implementation of an appropriate Shore Power Tariff in New York City would provide an impetus for ship owners to invest in ship-side Shore Power equipment and for widespread use of this technology in other ports on the East Coast. • g. None of the Company's tariff's accurately account for the unique service characteristics of ships that dock in New York City. • h. A high-rate setting working group charged with delivering a shore power recommendation should be convened quickly. Thank GOD for people like you.The only thing the owners of the port are interested in is making as much money as possible.The don't give a damn about you ,your family,even their workers.I know,I work here.